There’s no better way to visit Pisa that a nice run through this wonderful city and topped with a traditional Tuscan lunch! A full day experience with running, sightseeing, history, nice food and lots of fun! This tour is the complete Pisa Experience. You experience all the sights of Pisa, you eat at a traditional Tuscan restaurant and you have time to strolls the city. It is a unique way to get in touch with the town. We will reach Pisa by train and leave our bags in a hotel very close to Pisa central station. From there we start running and we will visit all the best known spots of Pisa such as the famous leaning tower, the cathedral, the Cavalieri square and the nice and picturesque historical centre, as well as lesser known gems away from the main touristic routes! The former city walls, recently restored, will impress runners as much as the arches of aqueduct built by the Medici Family, or the peculiar “Canale dei Navicelli” .While running we’ll discover nice stories about the history of this famous city, the former Maritime Republic of Pisa, and we will enjoy the vibrant atmosphere of the markets under the arcades of the old Borgo. 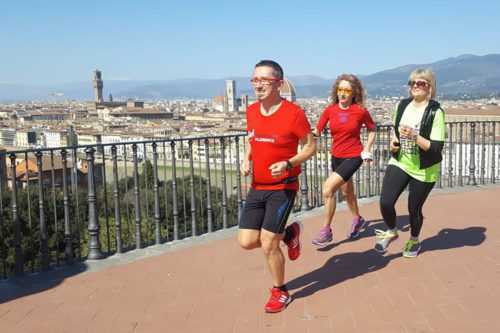 The running tour will end at the hotel where we can have a nice shower and be ready to get back in the historical centre to have a Tuscan lunch in a very typical “vineria” in one of the nicest small squares of the city centre. The lunch includes appetizer, first course, and second course with vegetables and a nice glass of Tuscan wine. In the afternoon (when the guide leaves) you can have a small walk in the city centre or visit a museum (ticket not included) and then take the train back to Florence. The included return ticket is valid from 1PM till 5 PM open for four hours, from 1 PM, return ticket with train frequency around 2 each hour. If you wish to stop in Pisa for one night the hotel offers to our guests a 15% discount. This tour is suitable for any kind of runner as the course is completely flat. Please note: The tour is bookable only for two or more people and has to be booked at least a week in advance. Meeting details: The tour provider will get in contact with you to provide you with more detailed information after the tour was booked. Please, bring along your mobile phone in case we need to contact each other. Receive news on new destinations, tours and running the world. Guido, i’ vorrei che tu e Lapo ed io fossimo presi per incantamento e messi in un vasel, ch’ad ogni vento per mare andasse al voler vostro e mio; Dante Alighieri – Sonetto - XIII Sec My name is Lapo and comes directly from Dante (see above). I am a florentine architect and a running addict! I’ve run several marathons all around Europe and I think that discovering a town by running is something really special. Can’t wait to run, but have a few questions? How fast do you run? Do we stop along the way? Can you run at a specific time? What if it rains (that’s easy – then we run ;-))? Can I cancel my booking? YES - HIT ME WITH YOUR NEWSLETTER! A cookie is a small text file containing information that a website transfers to your computer’s hard disk for record-keeping purposes and allows us to analyse our site traffic patterns and show you personalised content and ads. It does not contain chocolate chips, you cannot eat it and it does not give energy during a marathon 🏃🏃. It is however 0 calories.